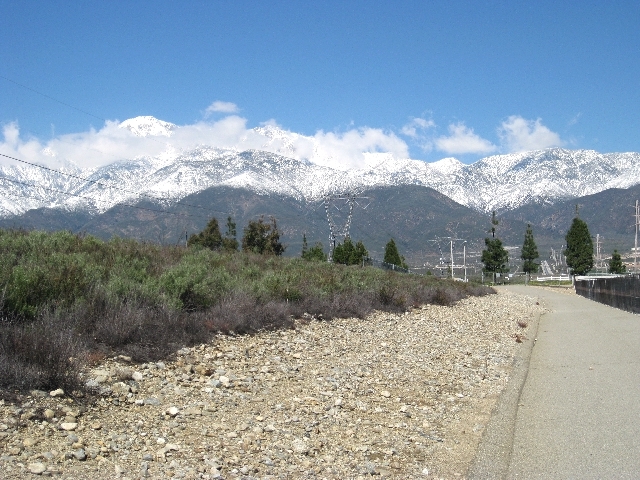 It was supposed to snow in the hills above Chatworth and a group of SFV cachers planned to go snow hiking/caching there at the end of Brown’s Canyon. Sunday morning arrived and there was no snow. Besides me, only Don_J showed up at the Antonovich Park trailhead. He wasn’t feeling 100% so he made the smart decision to go home. Instead of hiking alone, I too went home and looked on the gc.com site for another place to cache. 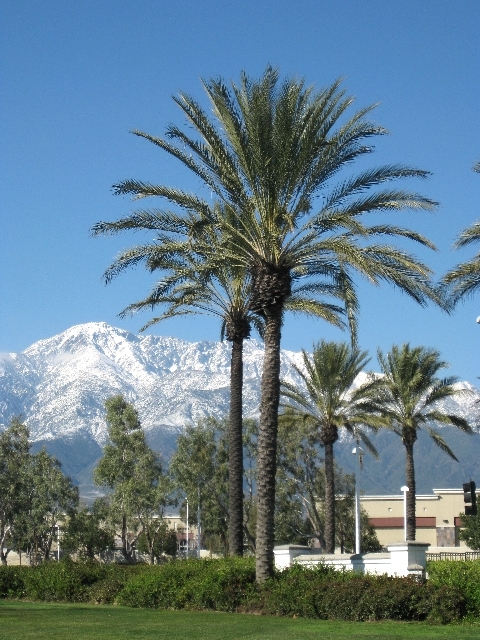 I chose Rancho Cucamonga and was on the road 90 minutes later. 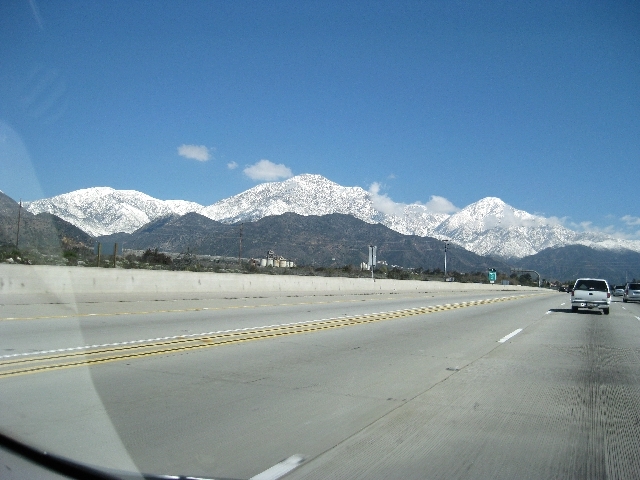 My disappointment at the lack of snow in Chatsworth was relieved by the sight of the mountains near my destination. 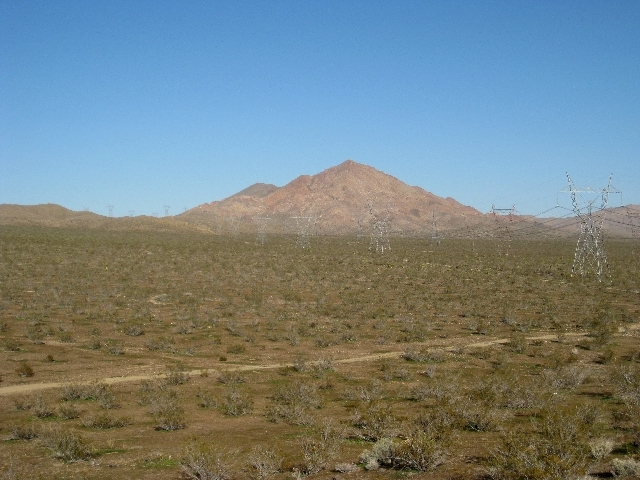 I started with a 10 cache hike along a drainage ‘wash.’ The mountains were behind me but I turned around often to look at them. 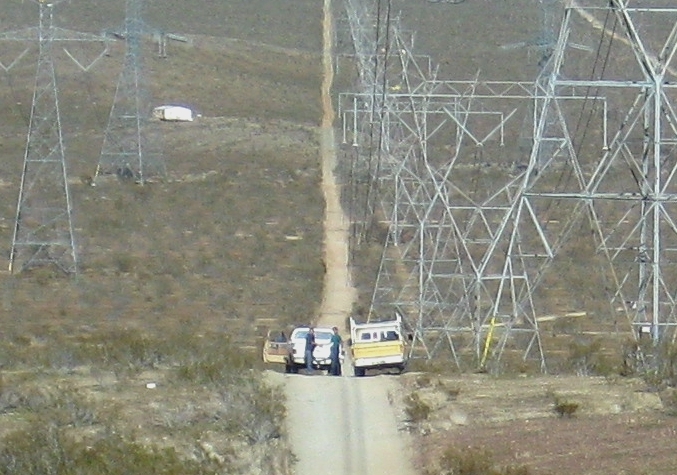 The straight line hike took me through 4 holes in chain link fences and over a low block wall. I even emerged at a street from behind the wrong side of a city “No Trespassing” sign. Instead of listing dire penalties, it just stated that violators assume all risks for injuries. The caches were easy finds. Most of the logs were wet. One of them was pushed so far into its narrow neck container that I couldn’t extract it, even with various tools. 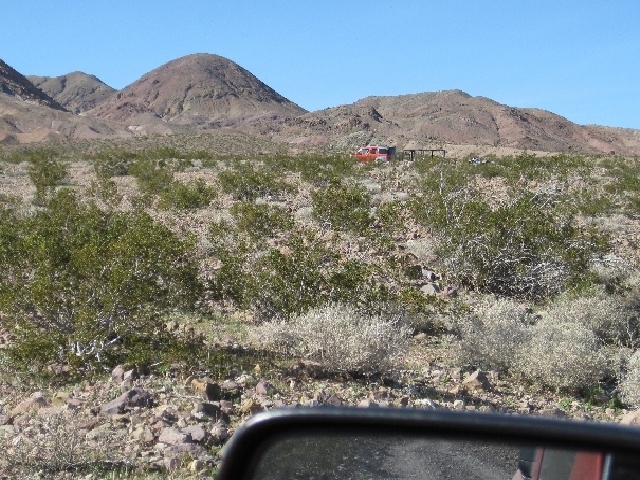 After ‘finding’ Transverse Range View Earthcache (GC22YE0), I hiked back to my car and drove South. I was irritated at the number of placements at high traffic intersections with no legal parking. There’s no way for a non-local driving cacher to reach them. Things were better in the completely deserted industrial sections. And again, I kept looking North at the snow. I found 10 more caches. Just before starting for home I saw a sad sight. 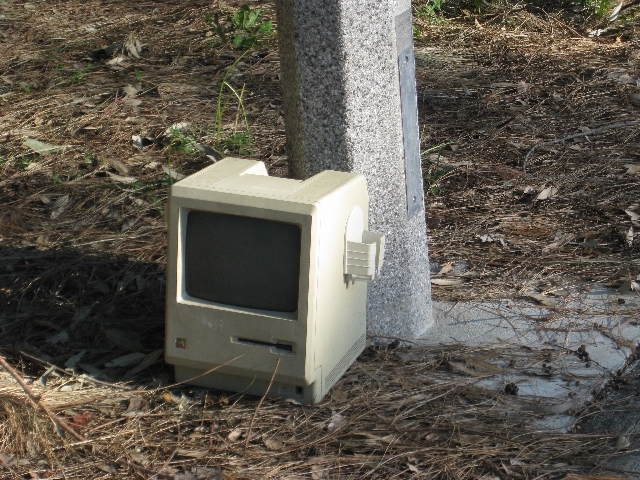 What an ignominious end for something that cost thousands of dollars 25 years ago… Maybe an Apple person will rescue it. STUFF: My camo tape collection. All 5 rolls were bought at WalMart. All except #4 were $3.97. The brand name is “DUCK TAPE.” They can be found in a wire display rack in the paint supply section. #4 was bought 2 years ago, for $4.97, I think, in sporting goods. 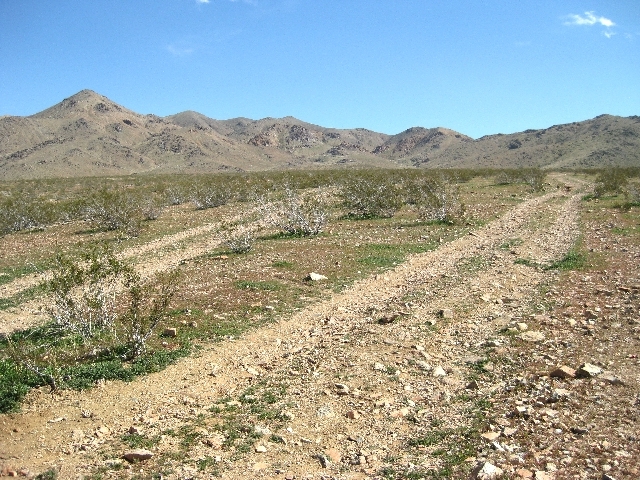 Look for some oddly camo’d caches in the West Valley, soon. 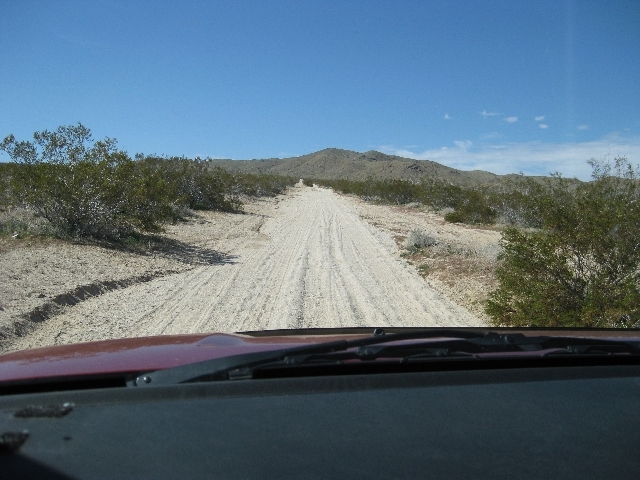 After 2 weekends of desert caching I needed a change of pace. 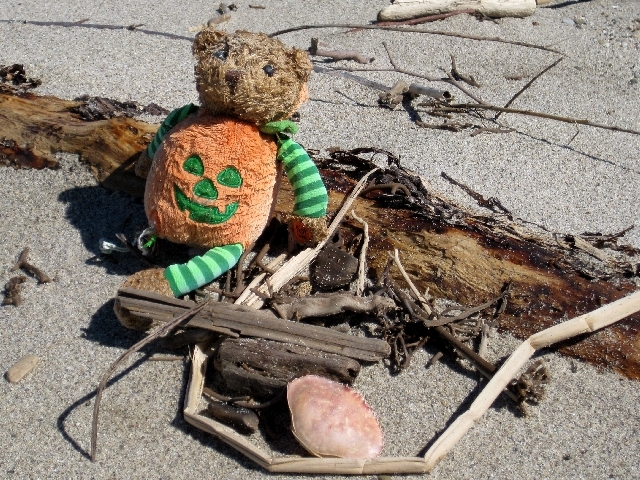 When fellow cacher T&A Divers mentioned a new series of beach caches in Ventura I knew where my next cache run would be. 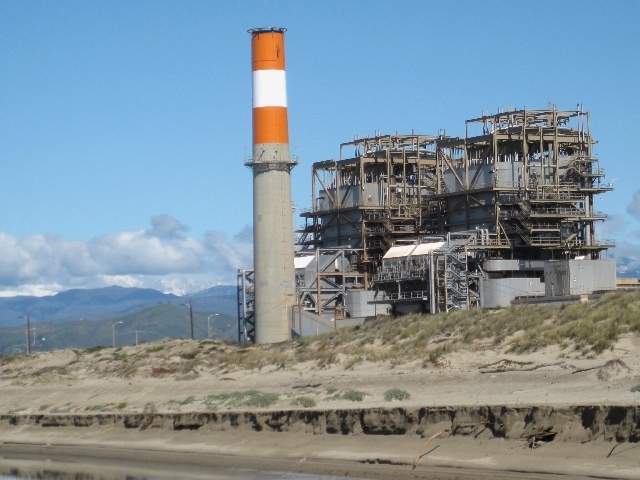 The geocaching.com map showed 12 new caches, The City Is Dead series, by turmoilmkr along a familiar 2 mile stretch of beach South of Ventura Harbor. The page for a nearby cache Tossed to the Curb (GC2NQ1J) cryptically seemed to indicate that the way to the series was across the street. What I saw there wasn’t encouraging. I’m more skittish than average about possible confrontations with security guards and angry property owners. Even though it looked like a short easy walk past the signs to the cache series and there were no workers in sight, I drove 1-1/2 miles south to UPS Ground (GCNHYX). There’s plenty of free street parking there and wide open beach access. 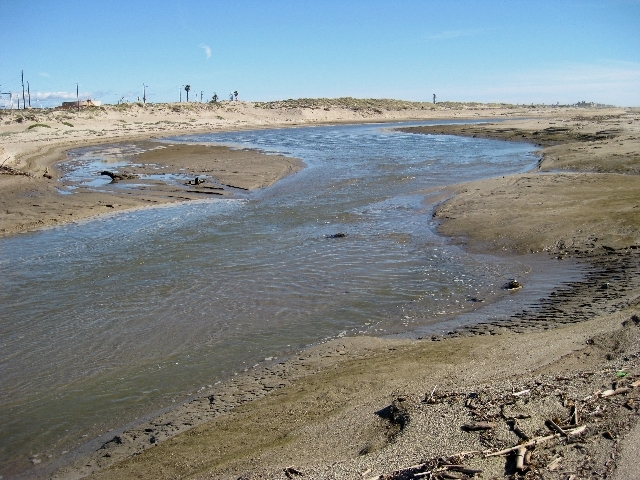 Immediately I saw the rough water made muddy by the week’s storms. 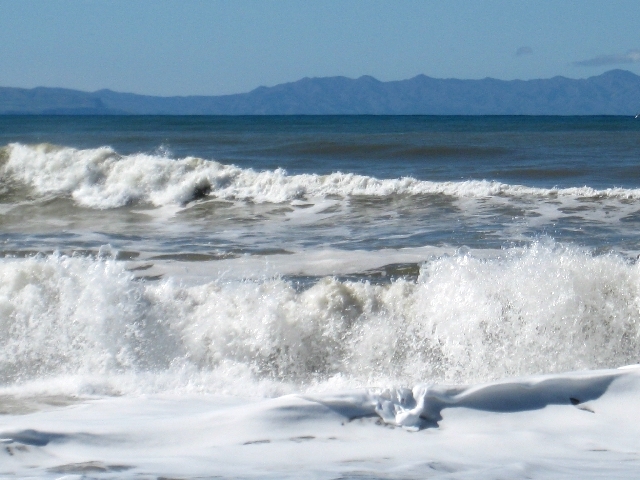 That’s Santa Cruz Island in the background. This is the biggest feature along the shoreline. Whatever it is, it looks dilapidated. But the mechanical noises emanating from inside indicate that it’s still operating. 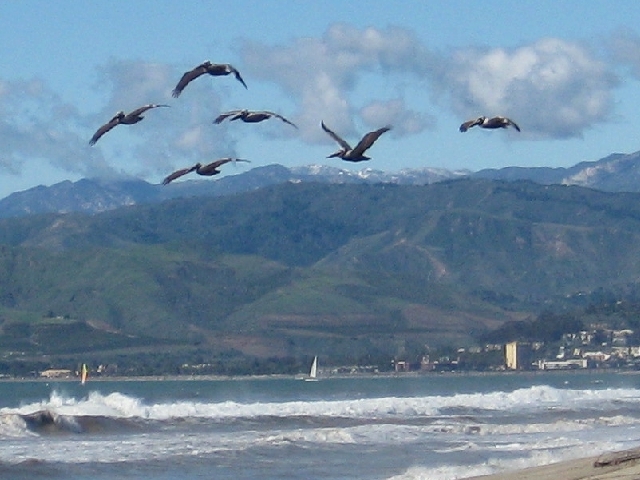 A squadron of pelicans flew by. 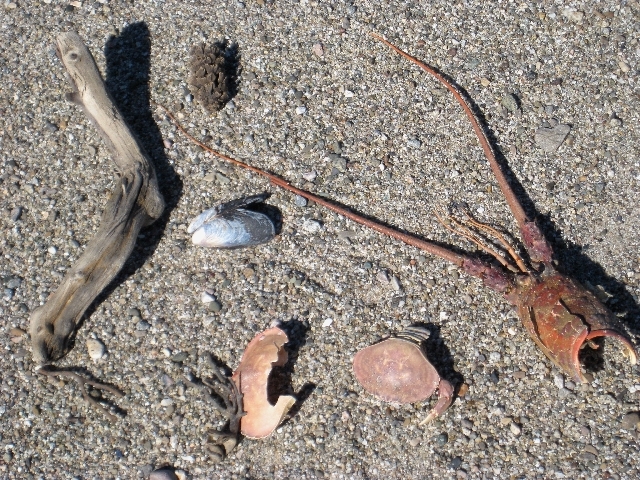 On the ground some strange things were washed up among the heaps of driftwood. The most common manmade items I saw were tennis balls, shoes, baseball caps and the occasional toy. 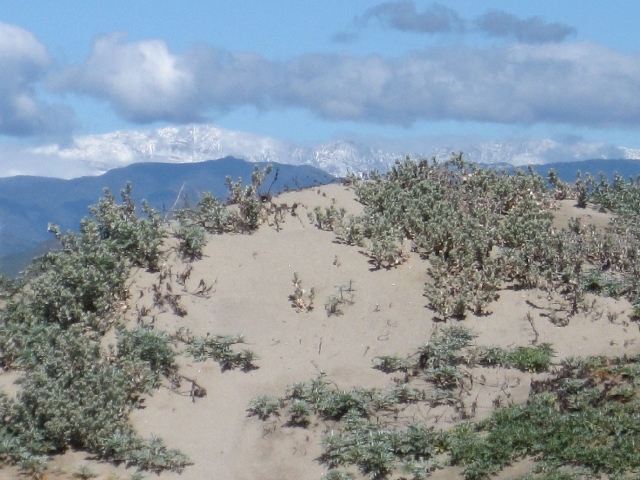 Seeing snow capped mountains behind the sand dunes while walking on the beach in shorts and t-shirt made me appreciate living in Southern California. 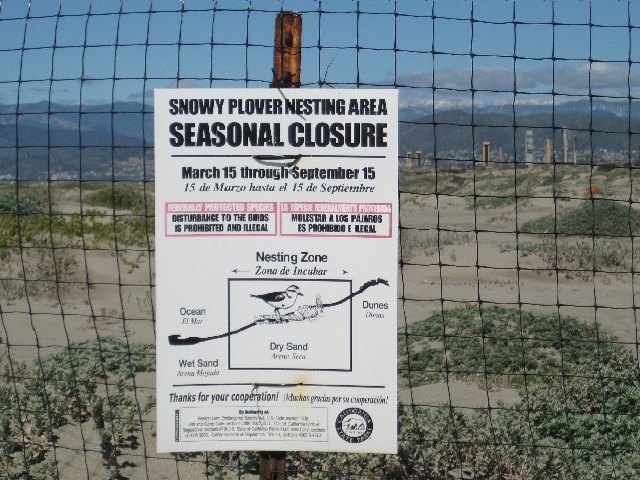 I soon ran into the “Snowy Plover Nesting Area – Seasonal Closure” signs and fence. Even though the closure period is listed as “March 15 through September15,” as far as I know the signs and fence are up year round. Maybe government budgets don’t allow for removing & replacing them every season. Fortunately for me there were no unfound caches behind the fence so there was no need to hop over. My Garmin Oregon 450T’s rudimentary stock map showed some of the series caches in the ocean. 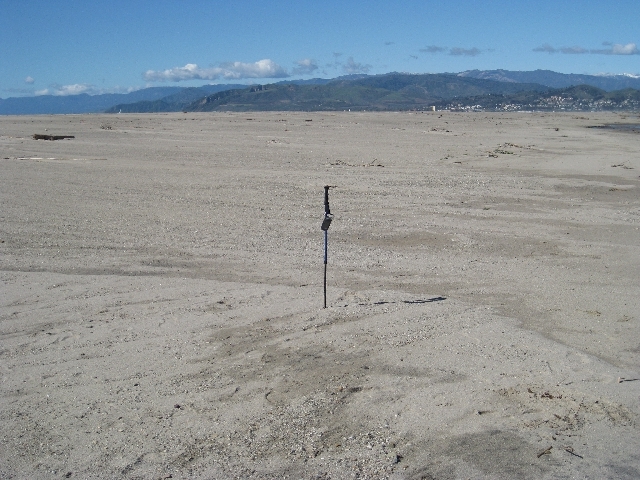 That was doubly wrong as all of the caches were several hundred feet inland from the surf zone. 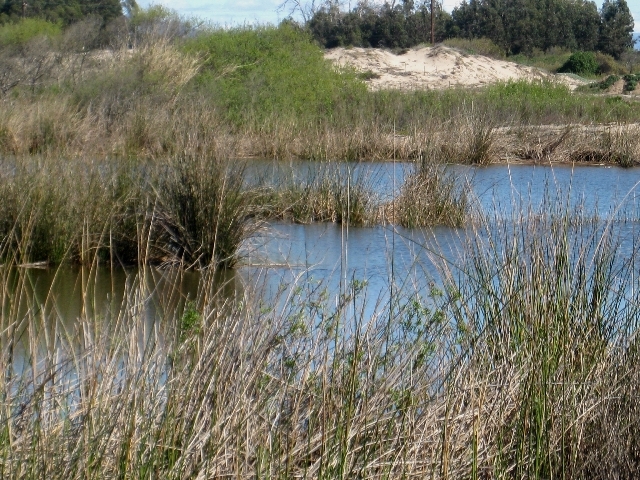 There were some marshes, salt water pools and streams that feed and drain them. Navigating around or across them to reach all of the caches was a challenge. Several water crossings were needed. Previous cachers logged getting wet and even giving up on parts of the series due to high water. I must’ve been exceptionally lucky to find easy 4’ crossings. Water never got in my shoes. 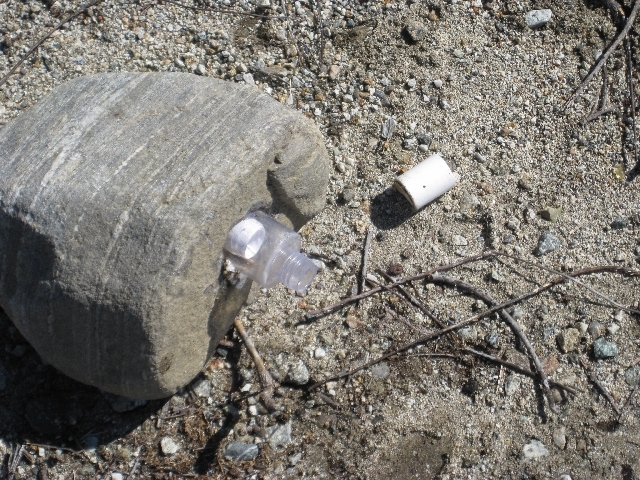 The caches were a nice mixture of lock-&-locks, bison tubes, match containers and soda bottle blanks. All of them were reasonably quick finds except #12 (GC2NJZV). Ground zero was in the middle of a completely flat, featureless area. That’s my hiking stick at ‘zero’. There were 2 small dead bushes 25’ away but the cache wasn’t in them. This was my only DNF (Did Not Find) of the series. I think that the container was washed away or buried. I headed directly toward the ocean to get away from the stream & pool obstacles and then turned South to walk along the high tide line. 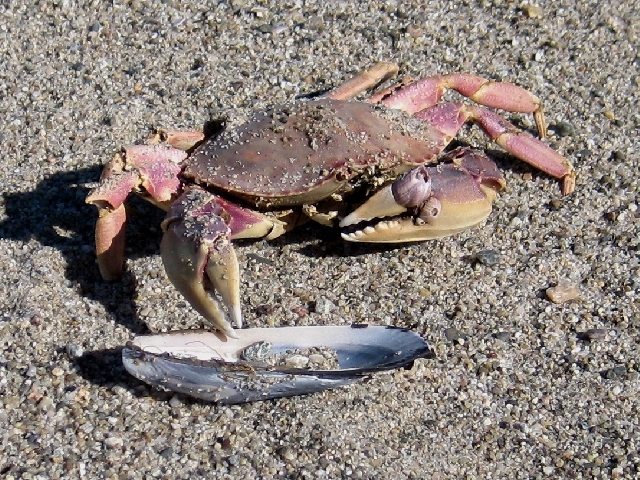 Lots of dead crabs were washed up. 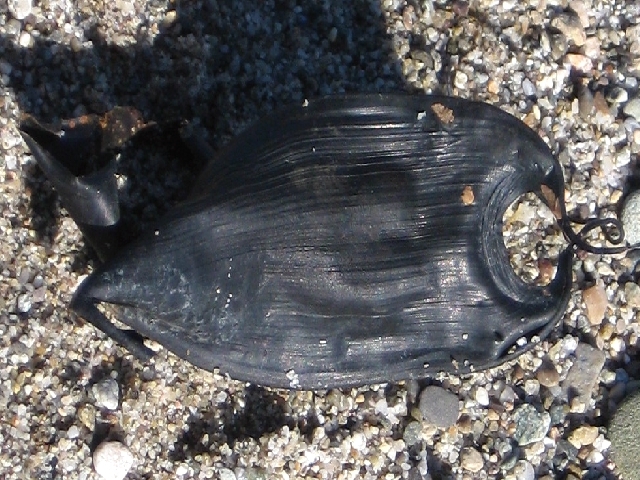 The sand was littered with mussel shells, mammalian looking bones (seals, sea lions?) and there was even a lobster. The last find of my 5.7 mile roundtrip hike was this shark egg sac. Back at home I realized that I didn’t find #6! A quick look online showed that #6 is a multi-cache. So it wasn’t even in my pocket query!! 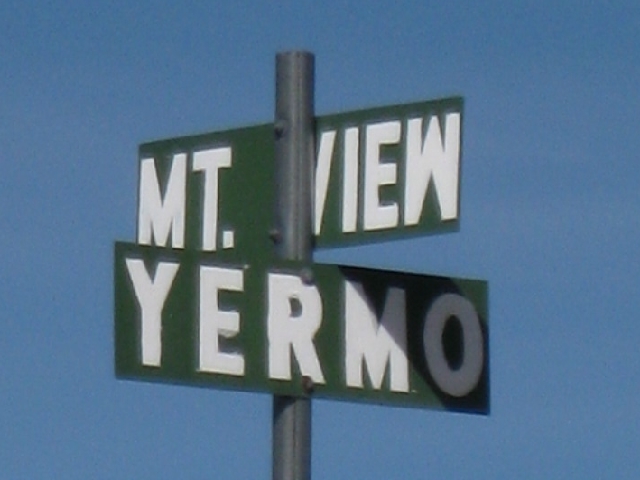 Recently I found the Phonetic Alphabet Series in Yermo. 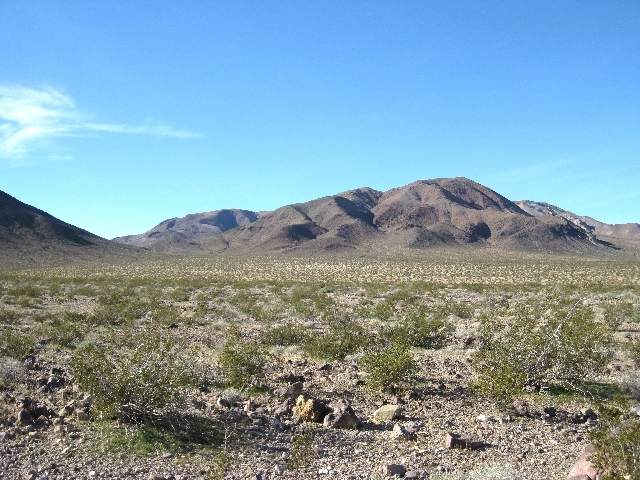 On Sunday I went in the same direction to find the Australian Cities series near Barstow. These are named for Australian cities, A to Z. The first few caches were scattered, not on the road straight in from the off ramp. I drove past Adelaid (GC2NCJ4) before I realized that Brisbane was closer. The mass of crisscrossing trails was confusing. After Fremantle, the road was clear. It was straight ahead and then veered off to the left at the top of this picture. Unlike the Phonetic Alphabet series where caches were usually within 100’ of the ‘road’ on the south side, the cities were mostly AT LEAST 100’ away, on either side. Some were more than 300’. ALL of the Australian City caches are 7.62mm ammo cans. 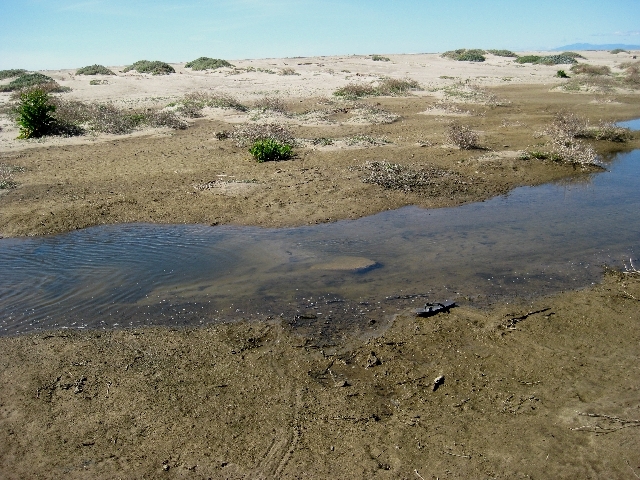 My Element floated slightly on a few sandy patches but I never felt in danger of getting stuck. Still, I recommend NOT stopping in these areas. 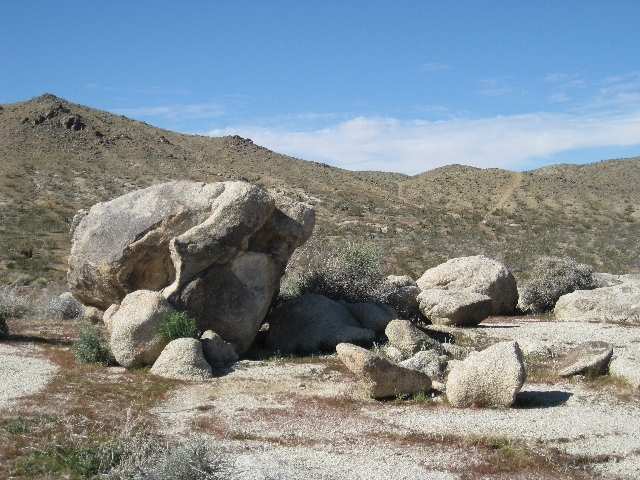 About 2/3 of the way in the flat landscape gave way to an increasing number of rocks which often marked a cache site. 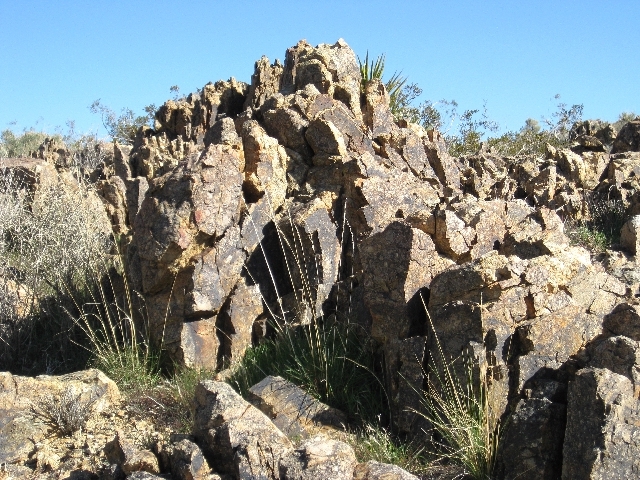 There were some shooters a ½ mile away from the rocks below. They ceased fire while I was visible. They started again when I was 2 more caches down the road. Here’s the uphill at Uluru (GC2NCTW) where I almost turned back. 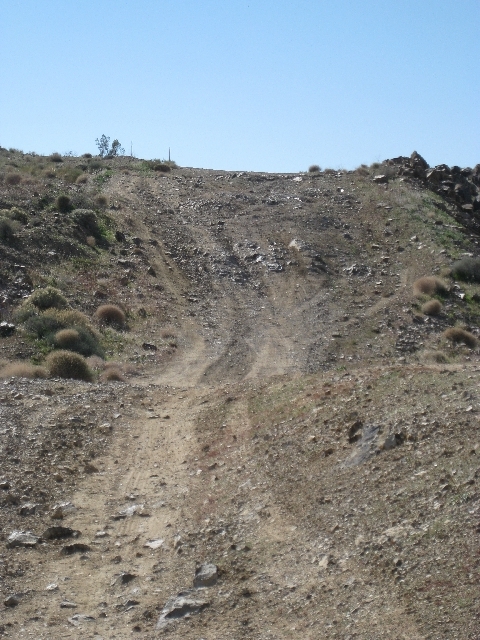 It’s loose rock covered and much steeper than it looks in the picture. But there were 5 more caches ahead to so I drove up and over. The cacher who recently did it in a “geo-Camry” was brave. Beyond the hill the rock formations got more interesting. There’s a cache here too. At the final cache, Zeehan (GC2NCWB) there was an unexpected view of a small city 4 miles away. Later I learned that it was Helendale. I found all 26 city caches (thanks Alan victor) and 3 non-series caches in just under 2-1/2 hours. The great weather and the prospect of finding another string of (easy looking on the map) caches one off ramp North kept me from going home early. 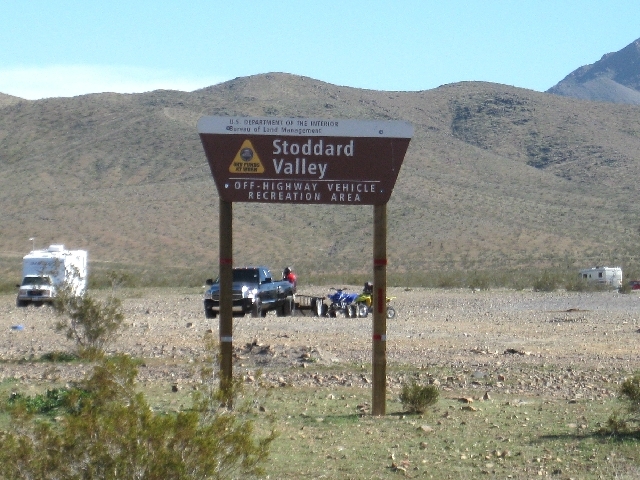 The trailhead for the Tank Series was at the “Stoddard Valley Off-Highway Vehicle Recreation Area.” All of my desert caching has been in absolutely vacant areas so I was surprised to see a dozen ATVs. I didn’t know whether an entry permit and/or special safety equipment was required. And even if they weren’t I don’t know anything about off road etiquette in congested areas. To avoid potential problems with a very different demographic I decided to leave the tanks to find on another day with a knowledgeable group. I drove a few miles South to the Sneaker Series. The towers there reminded me of the Phobia Series in Primm Nevada that I found last April. After finding ammo cans all day I was amused to see that the sneaker caches REALLY ARE sneakers. Near the second cache I saw 2 trucks blocking the road. Were they utility workers on Sunday? I hung back until the trucks continued ahead. They stopped where I thought the 3rd cache was hidden. But 5 minutes later after I’d found cache #2 the trucks were gone and I never saw them again. The sneakers are spaced about a ½ mile apart. I passed a complex of abandoned buildings that looked like they’d been used for paintball years ago. I found 5 sneakers and the road ahead looked easy. But I decided to call it a day to get home before dark. I need a change of pace. I’m going beach hiking/caching next. FEBRUARY 11, 2011 – The Devolution of Cache Logs & An Annoying New Trend? Online Log, circa 2003: Yours was the last of 21 caches I found on this record weekend!! Thanks for leaving the AA batteries. I took 2 because my ni-cads won’t hold a charge for more than 2 hours. I left a dollar and a big rubber lizard in exchange. 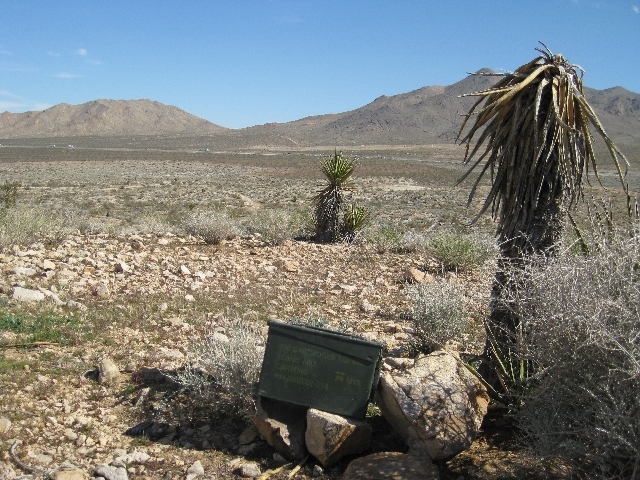 Oh, I think it’s a great idea to use surplus military ammunition boxes as cache containers. The hand painted camouflage was a nice touch. Thank you very much for an enjoyable find. 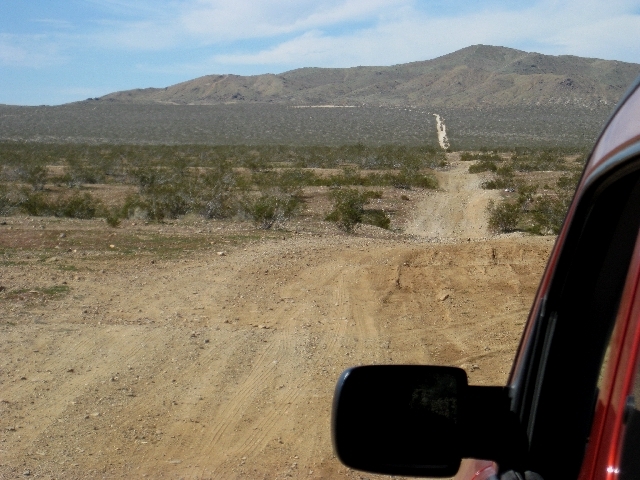 Online Log, circa 2005: The caches around here are only a mile apart! 12 of us drove in a 5 car convoy and found 79 of them before rushing home to watch Battlestar Galactica. Now I see how those mega cachers who do this all the time got 3,000 or even 4,000 finds! Online Log circa 2009: Found w/new app. Used geosense for the last 30’. Online Log circa 2011: Found all 800 in 14 hours. Whee! Online Log circa 2013: (blank)? An occasional single word “TFTC” logging on one of my caches doesn’t bother me. After all, most of mine are urban “numbers” hides. But even numbers hides require SOME effort to place and maintain. So a whole string of “TFTC” loggings mildly elevates my blood pressure. Then an out-of-area cacher logged 1 word, “check,” on 7 of my downtown caches. This ticked me off enough to send him an annoyed e-mail. He didn’t respond but sarcastically changed one of his “check” logs to a page-long diary filled with the minutiae of his time at GZ. It amused me enough to forgive the rest of his “check” logs. I was glad to see that he stopped logging “check” on others’ caches. by inputting an utterly blank log. There ARE some local cachers who sign physical logs and for whatever reason, never log online. That doesn’t irritate me at all. They’re not part of MY game. I just don’t want to see more blank logs online. I think that you don’t want them either. Let’s do what we can to discourage the proliferation of blanks. 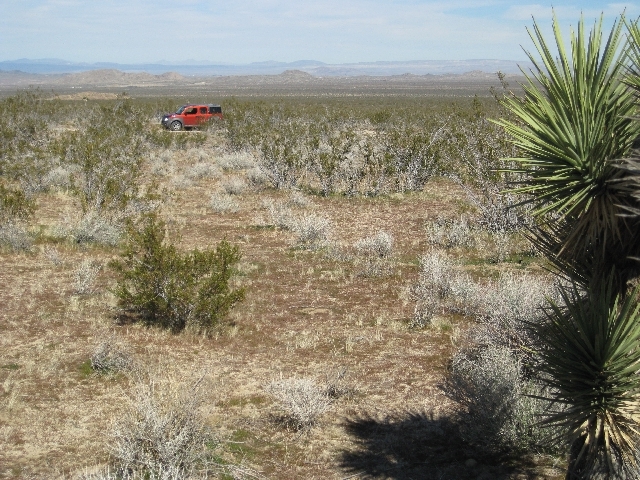 Every year I look forward to caching on Superbowl Sunday because muggle density is lower, there’s less traffic and more parking. I’d planned an urban cache run again this year. 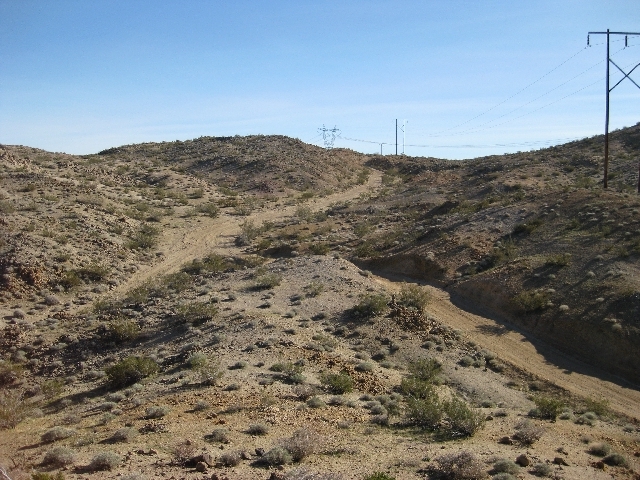 At the last minute I decided to boost my numbers on 2 mini power trails in Yermo, a 140 mile drive just beyond Barstow on the I-15. 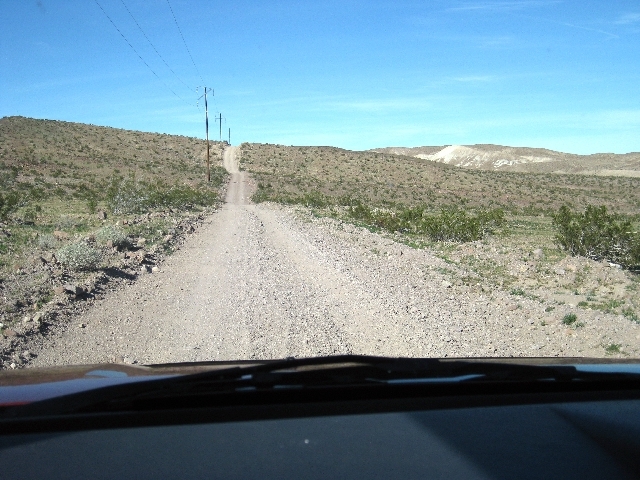 The Yermo Road series of 60 caches started here with these “Road Closed” signs at my back. The forward view looked like this, all the way through. Except for the first and last caches all of the containers were 2 liter soda bottle blanks. They look like 6” test tubes with a cap. They were each slipped into a tube sticking out an inch or two from the ground. Only the camo’d cap was visible. They’re unobtrusive but easily seen by cachers. 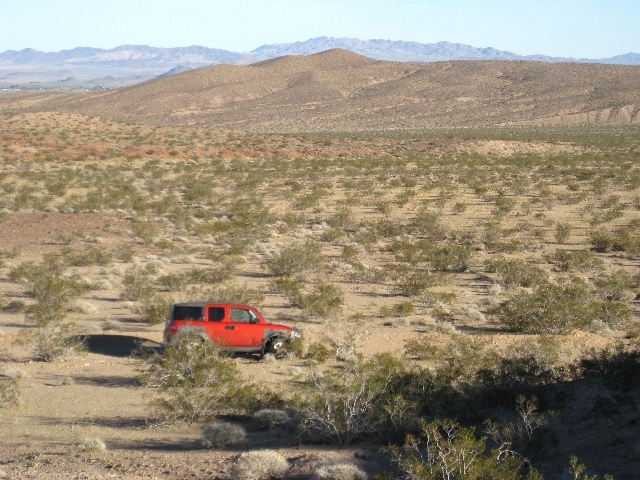 For the first 20 caches or so not a single vehicle passed me going either way. 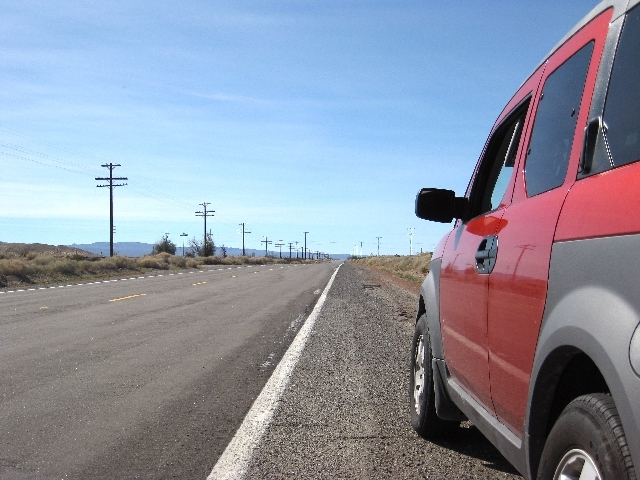 The roadsides were deserted too. The few nearby structures seemed to be abandoned. Here’s an extreme example. Traffic picked up and there was an occasional occupied house or business. Thanks to hiders DJAlan and JohnMac56 for NOT placing caches in front of those. The gaps let me pick up some speed and got airflow on my radiator. About ¾ of the way through, I detoured across the freeway to the Phonetic Alphabet Series on a long perpendicular dirt road. I’d found Alpha (GC2GQ7B) through Foxtrot in December but had to turn back in the rain. This time the weather was clear and 75 degrees. On the way to Golf I saw another Honda Element, the same color as mine, parked off road. It was towing a motorcycle so it probably wasn’t another cacher. After finding Golf and Hotel, I got smart and went to the end, past Zulu to AA. Then I worked my way out. 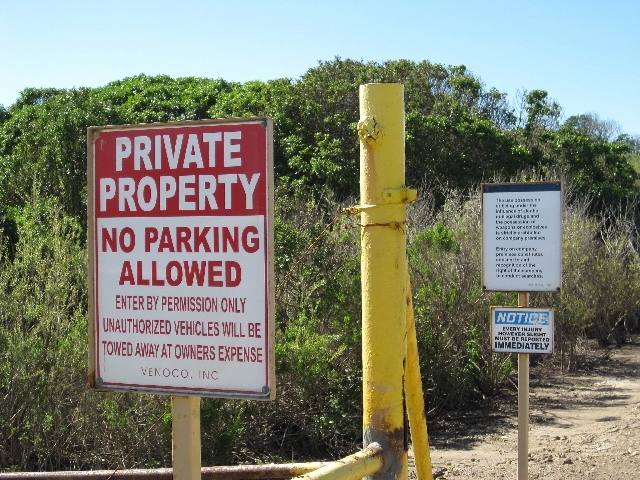 The cache pages say, “best to leave your Prius at home.” That’s good advice. 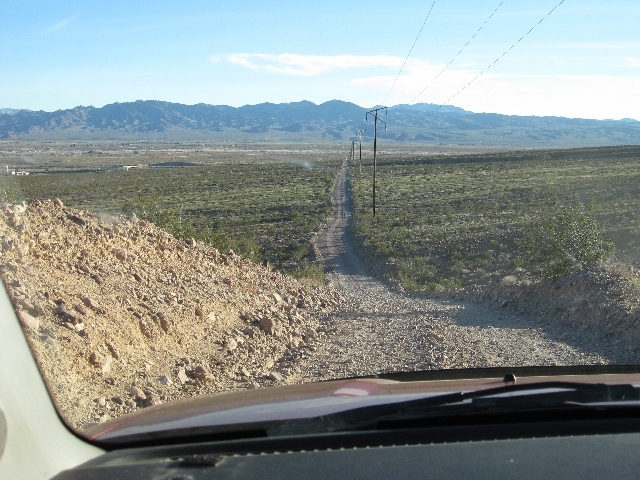 Most of the road looks like the picture below but there were a few steep hills that a Prius or similar car might not be able to handle. A few miles in, I enjoyed the roadside views with no sign of human activity. Here’s the view beyond AA. Is someone going to hide even more caches to extend the series? This is the view from Oscar (GC2GQ56) on my outgoing ride. The phonetic caches ranged from pint sized plastic jars to ammo cans. They were no farther than this from the road. Here’s the last mile back to the pavement. 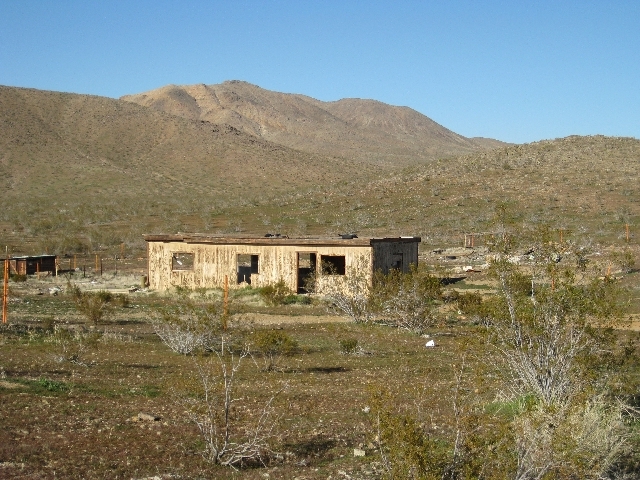 I reached it, crossed the freeway and found the last few Yermo Road caches. The day ended with 5 hours 10 minutes of caching, 85 finds and NO DNFs! At my plodding pace, it might take me several days. 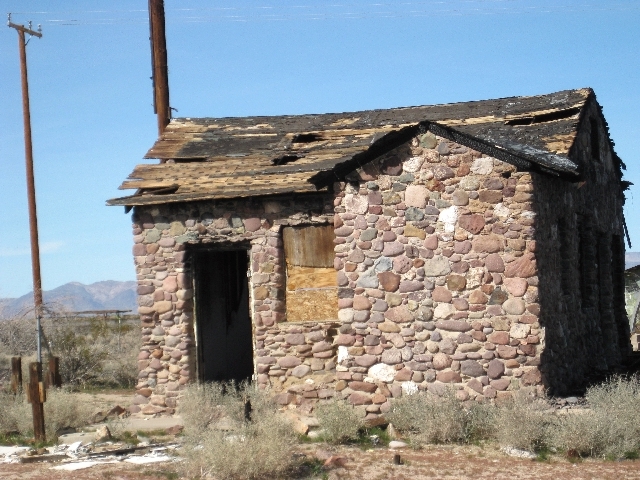 I hope to find the Route 66 Series (800+ caches) in the next few months. See you there. You are currently browsing the Dweeb's Diatribe blog archives for February, 2011.